ŠPORCL BACK TO BACH II. COMPLETE PERFORMANCE OF BACH’S CONCERTS FOR VIOLIN, STRINGS AND BASSO CONTINUO. Baroque concerts for violin, strings and basso continuo by Johann Sebastian Bach were staged by Pavel Šporcl in cooperation with the Czech Ensemble Baroque Orchestra on the 330th birth anniversary of this famous German composer. 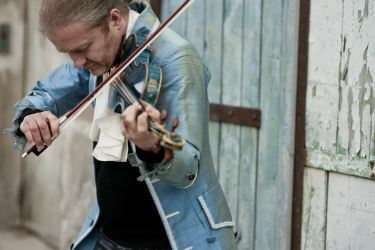 The unique complete performance of Bach’s Baroque concerts for violin, strings and basso continuo accompanied by contemporary instruments was given by Pavel Šporcl for the first time as part of his “Bacha na Šporcla” - Generali Tour 2015 in completely sold out churches and concert halls of eight Czech cities. This programme was also included in the rare Bach Marathon event in Prague and Brno, when Pavel Šporcl performed the complete works for violin by Bach three days in a row. He was praised by music critics for this exceptional project.